Fourth Row Center: Film Writings by Jason Bailey: New on Blu: "Stagecoach"
When the great John Ford made Stagecoach in 1939, it was his first sound western—he’d done some silent oaters, but hadn’t touched the genre in over a dozen years. It was also his first picture with John Wayne; their collaborative relationship would produce some of the great films of the 1940s and 1950s. And it was the first Ford film shot in Monument Valley, Utah, the beautiful setting for several of his subsequent westerns, including My Darling Clementine and She Wore a Yellow Ribbon. It’s appropriate that the film inaugurated so many noteworthy elements of Ford’s filmography, as Stagecoach is, for all intents and purposes, the archetypal western. 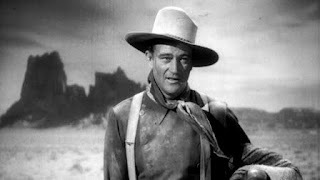 Ford may have later explored the genre with greater sociological and psychological sophistication (in The Man Who Shot Liberty Valance or The Searchers), and contemporaries like Hawks took the western to greater emotional and visceral heights (in films like Red River and Rio Bravo), but it all started here. Everything that we think of when we think of the western came from Stagecoach, which distilled the genre conventions and made the damned thing respectable. Wayne has the star-maker role of the Ringo Kid, but wasn’t even top-billed; though he had some 80 films to his credit, most were “Povery Row” westerns (many of them now available wherever public domain $1 DVDs are sold), and his only previous big picture of note was Raoul Walsh’s The Big Trail back in 1930. But Ford fought hard to get “Duke” for the role, even parting ways with producer David O. Selznick—who wanted Gary Cooper and Marlene Dietrich for the leads—and making the film for independent producer Walter Wanger (at half the budget). Wayne is billed under future film noir queen Claire Trevor, who appears here as Dallas, a woman of ill repute being driven out of the Arizona town of Tonto by the bluenoses in the local “law and order league.” They’ve also cast out drunken Doc Boone (Thomas Mitchell); the duo joins whiskey salesman Samuel Peacock (Donald Meek), crooked banker Henry Gatewood (Berton Churchill), cavalry wife Lucy Mallory (Louise Platt), and her self-appointed protector, Southern gambler Hatfield (John Carradine) on the crowded stage. The driver of the stagecoach is Buck (Andy Devine); riding shotgun is Marshall Curly Wilcox (George Bancroft), who is on the lookout for the Ringo Kid (Wayne). The stagecoach’s destination is Lordsburg, and Curly’s come along because Buck brought word that Luke Plummer has been spotted there. Curly knows that means Ringo’s headed in the same direction—he’s seeking revenge against Plummer, who murdered Ringo’s brother and father. All that background makes for one beautifully prepared entrance, and Ford pays it off with the most famous introductory shot that side of The Third Man—a slick push in to tight close-up on the Duke as the stagecoach comes upon him off the trail. Ringo’s an outlaw, sure, but with good cause—and Curly primarily wants to put him behind bars for his own protection. His crimes (past and future) are honorable, and more than that, he’s a man’s man and a gentleman to women; in other words, he’s the prototypical Wayne antihero. Wayne had reportedly wanted to work with Ford for years, but the director kept pushing him off, wanting to wait until Wayne was a stronger actor, and until he had the right role for him. The Ringo Kid is the right role, and Wayne is terrific in it—not just in his man-of-action scenes, not just playing the beats that we came to identify with him, but in his quieter moments, like his understated hallway scene at Apache Wells, strategizing with station master Chris (Chris Pin Martin). Wayne may have been a “movie star” first and an actor second, but that’s not to say he wasn’t capable of some damned fine acting. The picture is kept humming by the wit and intelligence of the screenplay, by Dudley Nichols and an uncredited Ben Hecht (from Ernest Haycox’s story); our interest is sustained by the rich comic byplay inside that packed stagecoach, much of it supplied by the drunken but wise doc, memorably played by Mitchell (best remembered these days as loveable “Uncle Billy” in It’s a Wonderful Life). His gags are verbal as well as visual—he bids the town barkeep, with whom he’s run up an unpaid tab, a fond farewell by noting, “Economically, I haven’t been of much value to you,” and when Doc goes to “wave” goodbye to the killjoy women who’ve given him the boot, the cutaway to the shocked ladies tells us all we need to know about his parting gesture. Devine’s Buck, a fundamentally frightened fellow with a hoarse, cracking voice, also provides able comic support, and the running jokes—like how everyone keeps mistaking Peacock for a man of the cloth—are brought off well. But there are more serious themes at work here as well; the shunning of Dallas in Arizona carries right over onto the stagecoach, and the communal table social dynamics of their stop for “grub” at Dry Fork is simultaneously high-school immature and absolutely heartbreaking. It’s almost funny, how Ringo and Dallas end up running off together without so much as sharing a kiss, but they’re bound together by their outcast status—they fall in with each other partly because no one else will have them. Ford’s direction isn’t flawless—that musical interlude slows things down considerably, and your attention meanders away from the picture—and the film suffers from the casual sexism and racism we’ve come to expect but still wince at (as with that unfortunate bit about whether Chris will more miss the whipping and working of his wife or the horse that she stole). But the filmmaking is smoothly professional (Orson Welles reportedly screened Stagecoach upwards of 40 times during his pre-production period for Citizen Kane). There’s a stodgy insert or two—most noticeably those too-obvious shots of stodgy Gatewood in the opening scenes—but Ford’s compositions and shot combinations are, for the most part, inspired and thrillingly alive. The stagecoach’s river crossing is inventively photographed from atop the jostling vehicle, in a pseudo-handheld style that gives the scene a real rise. The centerpiece sequence is the Apache attack, a thrilling, fast-paced set piece that starts with a startling shock moment and blasts forward from there. As Wayne hops from horse to horse, Ford’s camera glides around the galloping stage in a breathless long take; cinematographer Bert Glennon also utilizes some astonishing low-angle photography, as the stagecoach and attacking Apaches hop right over his low-slung lens. As the film draws to a close, Ford makes a bold choice: he does the full build-up to the big showdown between Ringo and Luke Plummer, then cuts away at the last second to Dallas hearing the shots ring out across town. It’s a suspense device, sure, meant to draw out the winner of the duel, but it also hints at Ford’s capability for thwarting expectations and taking unexpected turns. Those inclinations would be more fully explored and exploited in the years to come. But in Stagecoach, he crafted the template that he and his contemporaries would work from for decades. So much of what Ford did in Stagecoach became part and parcel for the western genre, it may be hard to appreciate how important the film was; like Psycho and Halloween in the horror genre or Annie Hall in romantic comedy, we’ve seen it duplicated so many times that, through no fault of its own, the original loses a bit of its punch. But it hasn’t lost its considerable power to entertain and invigorate, and there is still nothing quite like watching an actor become a star in front of your very eyes. "Stagecoach" is available on DVD and Blu-ray from the Criterion Collection on Tuesday, May 25. For full A/V and bonus feature details, read this review on DVD Talk.